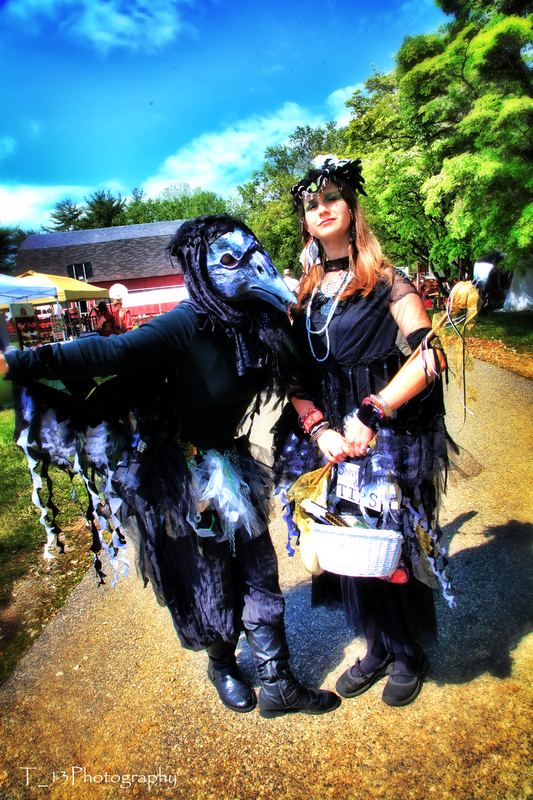 Queen Maggie (right) and her lady-in-waiting Pie of the Magpie Court visit the 2013 Maryland Faerie Festival. Photo Courtesy of Tawny Woodchucker. Queen Maggie and Pie enjoyed a visit to the 2013 Maryland Faerie Festival, where they collected many wonderful shiny things for their nests and inducted new friends into the Magpie Court. Members of the Magpie Court are welcomed by magpies everywhere, as well as by their corvid cousins: crows, ravens, jackdaws, choughs, nutcrackers, treepies, jays, and rooks. Court herald and jester Cousin Squelch announced the arrival of the Queen and Pie as they wandered among the many shiny sights of the festival. Her Majesty was excessively pleased with the Maryland Faerie Festival and particularly enjoyed liasing with Wedji Tucheeks, Eye of Isis, Maharal, and the Aubergine Faeries. Meanwhile, Amy Fae and Alizarin were spotted with those same Aubergine Faeries, who delighted both Spoutwood and Maryland Faerie Festivals with dances from far-off lands, mundane and fae alike. Amy Fae stole hearts young and old as she personified the rogue of the Bengali song Awara, while Alizarin’s playful saidi solo drew delighted sighs and smiles from the audience. 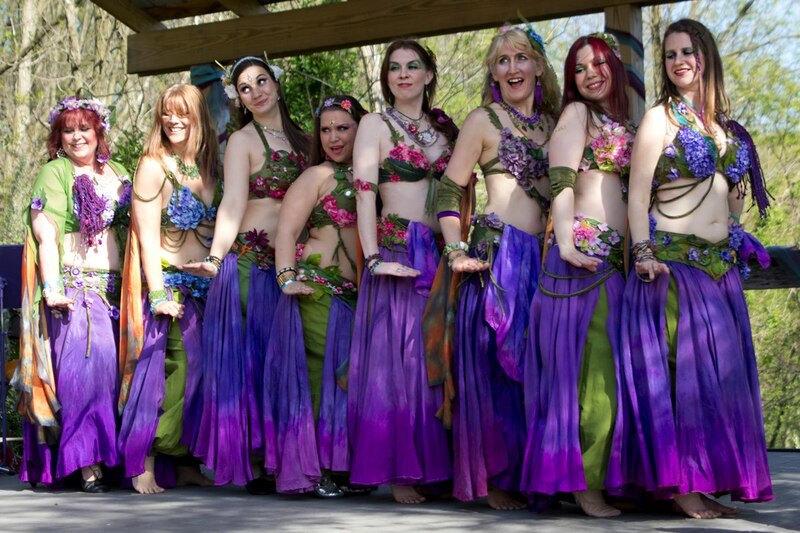 The Aubergine Faeries dance at Spoutwood Farm’s 2013 May Day Fairie Festival. Photo courtesy of Willow Dower. The local Faerie Festival season may be wrapping up, but Baba Ghanoush is looking forward to other exciting, if not quite so winged, events. We’ll be appearing as ourselves and with our fellow Aubergines at the All Seasons Hafla on Sunday, June 2nd. And we are very pleased to announce the first ever Baba Ghanoush workshop: BG’s Belly Dance Duet Toolkit. We’ll be co-teaching this exciting workshop at Halima’s in Westminster on Sunday, July 28, 1:00-3:00 pm. Check out the Facebook event page for details! June 2, 3:00pm (Sunday) – All Seasons Hafla at 7 West Bistro in Towson, MD. BG duet and also perform with troupe Aubergine at this local monthly hafla. $10. July 28, 1:00pm (Sunday) – Baba Ghanoush’s Belly Dance Duet Toolkit, workshop at Halima’s House on the Hill in Westminster, MD. Come build your own toolkit of belly dance duet strategies! $35/person; no partner necessary. ← Look out, 2013! Here comes Baba Ghanoush!